What would you do if you are the executive of a Nasdaq-listed company getting a “deficiency notice” from Nasdaq threatening to delist your company unless the market value rose above $35 million for 10 business days in a row? Long Island Ice Tea did receive such warning in October. Typically, once a deficiency notice has been sent from Nasdaq, a company has only 90 days to comply with the continued listing standards. That means LTEA needs to shape up or gets shipped out by this month. Worry not, LTEA has found the right open-sesame password to dodge the delisting bullet. As the company’s name implies, Long Island Ice Tea Corp. is a beverage company focused on non-alcoholic iced teas and lemonades based in Farmingdale, New York. The company was at risk of being booted off Nasdaq before being rescued by a simple name change last month. Yes, all the company did was to change its name to Long Blockchain Corp. (LBCC) on Dec. 21 with some vague statement that Long Blockchain is in the “preliminary stages of evaluating specific opportunities” and that it plans to continue to focus on the beverage business (if that makes any sense). Its stock price almost tripled in one day. At the time, the company has no agreements with any blockchain entities or even in negotiation with one, not to mention the illogic of an ice tea company “diversifying” into blockchain technology. However, investors are blinded by the buzz word “Blockchain” and LBBC market cap has stayed above the $35 million threshold required by Nasdaq since the name change on Dec. 21. Typically, a delisting warning from an exchange usually means this company is in a downward spiral either due to some fundamental and economic difficulties and/or in a cyclical down market for that particular industry sector. 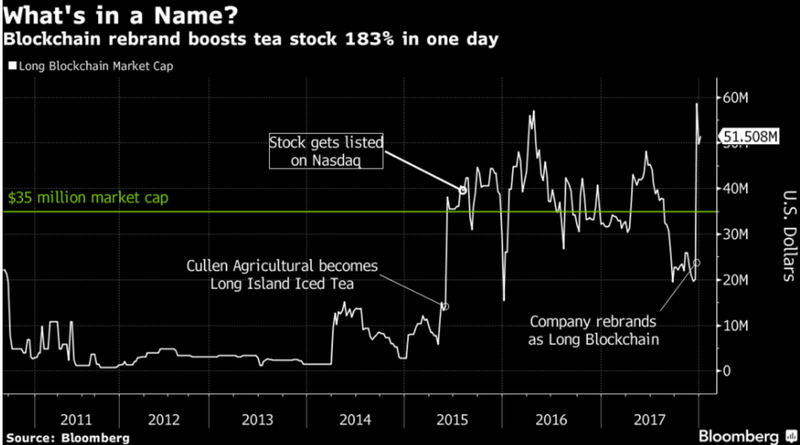 As Bloomberg reports, LTEA has posted consecutive quarterly losses “for years”. It had a $3.9 million deficit in 3Q 2017 and only two customers made up 42% of its $1.6 million in net sales. It is easy to see how it got to this delisting predicament. According to Bloomberg, one of the company’s founders and majority shareholders is “known for lavish parties and dating supermodels” with odd connections to super model Heidi Klum, the Kennedy family, and America Apparel, Inc. (which filed bankruptcy in 2015.) That same majority shareholder also settled with the U.S. SEC in 2001 for failure to disclose certain insider trading transactions. Just like the gold rush, all these do not seem to matter a bit to investors in the bitcoin euphoria. The irrational enthusiasm from investors seem to suggest as long as there’s “intention” to dabble in blockchain technology, it is enough to keep throwing money at an ice tea company with poor core business prospect and management. Sorry, I don’t think Heidi or even the entire Kennedy family can save this dog. LBBC stock went from $2.44 to almost $7 in one day after the name change, and closed at $4.85 today. I think it looks more like a once-in-a-life-time opportunity to pump and dump a dog penny stock to as many bitcoin-crazed investors as possible. Caveat emptor, let the buyer beware! Disclosure: The author and EconMatters have no position in aforementioned stocks. The views and opinions expressed in this article are author's own.